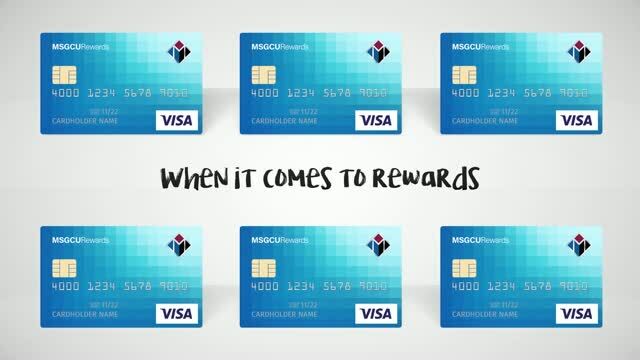 When you pay with your MSGCU Rewards Visa, you earn points that can be used for discounted travel, brand-name gifts, or 1% cash back. You'll also save money over the long run with fewer fees and a low interest rate, making this card the gift that keeps on giving. A rewards credit card that lets you pick your passion. With Michigan Schools and Government Credit Union’s Reward Visa Card, you can choose the reward that's perfect for you. How can I earn points with my MSGCU Rewards Credit Card? Whom should I contact if I have questions regarding points under the ScoreCard Rewards Program? Where can find complete details about the ScoreCard Rewards program? ScoreCard Rewards is a platform that powers the rewards program for the MSGCU Rewards Credit Card. You will manage your reward points with ScoreCard for qualifying transactions. ScoreCard is also known as Award Headquarters. 2. How can I earn points with my MSGCU Rewards Credit Card? You earn rewards on everything you purchase. No need to worry about only getting points on rotating categories or at certain stores. As an added benefit, our ScoreMore program can earn you extra points. For complete details, please refer to the Rules and FAQ documents located at the bottom of your ScoreCard Rewards account. Our ScoreMore feature allows you to earn extra points by shopping at participating merchants you love. To learn more, log in to ScoreCard Rewards account to see participating merchants and offers. Simply select the offer you want, shop, and earn. 4. How do I log in to the ScoreCard Rewards website? MSGCU Online Banking — Log in to your MSGCU Online Banking Account and select the gear wheel to the left of your Visa Rewards account on the Account Balances page. Once you have clicked on the gear wheel, select Rewards from the Account Actions pop-up. You will be automatically logged into your ScoreCard Rewards account. ScoreCardRewards.com — Simply visit ScoreCardRewards.com to log in. On your first visit, you will need to set up your profile with a username and password. You will also be asked to set up some security questions and answers for password retrieval. Once you create your profile, you will log in using your username and password. 5. How do I know how many points I have? To view your points balance, simply log in to your ScoreCard Rewards account, call Award Headquarters 24/7 at (800) 854-0790, or view your monthly ScoreCard Rewards eStatement. 6. How can I redeem points? Log in to your ScoreCard Rewards account to select from their vast catalog of rewards. You may use the online travel booking site to obtain select air awards. In addition, you may purchase additional airline tickets and make car and hotel reservations online. Call ScoreCard customer service 24/7 at (800) 854-0790. Travel awards, airline tickets, vacation packages, and cruises may be ordered by calling and speaking with a Travel Services Representative. Travel Services Representatives can assist with booking both purchased as well as redeemed awards travel items. Print an order form from ScoreCardRewards.com. If using the form, simply complete it and mail to the address printed on the form. 7. Whom should I contact if I have questions regarding points under the ScoreCard Rewards Program? You can call Award Headquarters 24/7 at (800) 854-0790. 8. Where can find complete details about the ScoreCard Rewards program? For complete details about the ScoreCard Rewards program, please refer to the Rules and FAQ documents located at the bottom of your ScoreCard Rewards account homepage. With our householding feature, you can link multiple MSGCU Rewards accounts for the purpose of combining and redeeming points for awards. Householding your points together allows you to reach higher reward levels faster, giving you greater reward opportunities. To learn more about this feature, or to household eligible MSGCU Rewards accounts together, log in to the ScoreCard Rewards website and select “Householding” from the Account dropdown. Earn points on every purchase you make. Redeem them at scorecardrewards.com.